If you are looking for a custom-fit mouthguard for sports, teeth grinding, or TMJ disorders, Dr. Byron W. Wall, DDS, has a solution for you. At Cosmetic Dentistry of New Mexico, we proudly work with the renowned TekFit company to provide comfortable appliances that are a near-perfect fit for your teeth. Additionally, Dr. Wall is an expert in neuromuscular dentistry. He will ensure that your device maintains the healthy force of your bite or improves your jaw alignment, if needed. To learn more about custom mouthguards at our Albuquerque, NM dental practice, contact our office today. You would probably not play football without a helmet or other protective gear. However, like many people, you may routinely go on the field without an appropriate oral device. 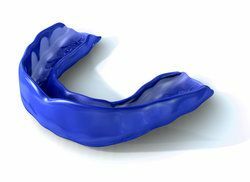 Sports mouthguards can prevent serious dental injuries, such as knocked out or broken teeth. They can also avert damage to your soft tissues. Most sporting goods stores sell mouthguards, but because they are premade, they may fit loosely around your teeth. Some may even hinder breathing and affect your athletic performance. Our TekFit guards, on the other hand, are carefully crafted to fit your mouth. With these devices, Dr. Wall can ensure your comfort and more effectively protect your smile. Plus, you can even customize your device with your team color or jersey number. Bruxism, or chronic teeth grinding and clenching, can cause significant problems for your overall dental health. The constant stress on your teeth can erode your dental enamel and lead to cracks and chips. In addition, your jaw joints will come under a lot of pressure, and you could develop TMJ Disorders. 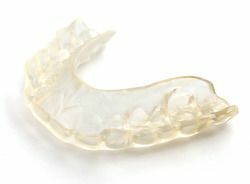 A bruxism mouthguard, much like a sports appliance, will fit right over your top and bottom teeth. It will keep your teeth from touching so that you are no longer able to clench them together. In most cases, you will only need to wear the device at night. Thanks to Dr. Wall’s precision and the advanced techniques of the TekFit company, you should find it easy to sleep with this device. Dr. Wall will combine oral appliances with advanced neuromuscular techniques to treat TMJ disorders. This condition arises when your jaw joints are damaged or when the nearby tissues become inflamed. Often, this damage is the result of bruxism. TMJ disorders can also occur because of orthodontic issues, missing teeth, or jaw misalignment. Dr. Wall will first use the Myomonitor to treat your facial muscles with low frequency electrical signals. These impulses will release muscle tension and stimulate blood flow. Then Dr. Wall will design a custom-made orthotic to reposition your jaw and prevent further tension. Thanks to this comprehensive level of treatment, he can target the underlying cause of your jaw pain for lasting results. No matter what type of mouthguard you require, we are ready to provide a comfortable, custom-made device. Take steps to protect your oral health and contact our office today.